this is my favorite food group: the meat and cheese plate. Bacchanal: Our first stop was Bacchanal Wine. This was our first time there, and I had heard nothing but good things for some respected eaters. Just to be honest, it’s not much to look at from the outside. It’s shoved on a corner in the middle of a bohemian type neighborhood with paint peeling on the outside walls and you hope that fence stays standing another couple of hours while you’re eating there. You have to be assertive if you want to eat here (hello 27 year old bravery! ), i.e. it wasn’t created with introverts like me in mind. It’s a 21 and up type place, and everyone, even the grey balding biker man in front of us got carded, so don’t leave your ID at home. You walk in and pick a bottle of wine and choose some cheese and meat from the fridge. The staff was kind and helpful, and didn’t make me feel dumb for asking questions. You pay for your goods, which they take back and assemble with generous portions of bread, nuts, pickled things and other delicious accompaniments and bring them to your table. You pick your own seat and your own wine glasses (we were late and had to stand, but they have standing tables) so get there early if you want a table, seating is first come first serve, and the seating is mostly outside. This type of eating is literally my favorite: wine + cheese + meat + pickled things + fruit and bread, and it was the best of it’s kind I’ve ever had. Plus, live music every night, and it was finally not so humid outside that I regretted my life, so the night was a success! Bacchanal sort of feels like the kind of party I want to have in my own back yard, so take some friends and expect to have a good time. Friendliness/helpfulness of the Staff: 5! my poor attempt to photograph what we ate. it was so delicious i didn’t care if it wasn’t properly captured. Willa Jean: Our second stop was for brunch Saturday morning, at one of chef John Besh’s new places called Willa Jean. It was just a short walk from our hotel (Hotel Modern, nice, recently remodeled place, overall it gets a 4). IT WAS AMAZING. I’m a huge fan of his restaurants, everything always seems so well done, and this was no exception. I can barely talk about this place is was so good. A perfect hipster with dark jeans and a black and white plaid shirt will gladly take your order and pour you as many mugs of coffee as you can drink. I got avocado toast topped with arugula, radish slices and 2 poached eggs, as well as their fried chicken biscuit with honey Tabasco sauce, something I’m probably going to try and recreate at home. Aaron ordered the English muffin with blue crab topped with a poached egg and hollandaise sauce, and a slab of grilled pumpkin bread which forever changed the way I feel about pumpkin bread. You need this pumpkin bread in your life. We walked away with incredibly full and contented bellies and we can’t wait to eat there again. The food: 5 million stars. Generous portions, but not outrageous. They were extremely busy but the wait wasn’t too long. The poached eggs were perfect. Versatile menu, there should be something for everyone. Atmosphere/decor: 5. really cool looking on the inside, also very clean. Tip: make a reservation or get it to go, the wait could get long. 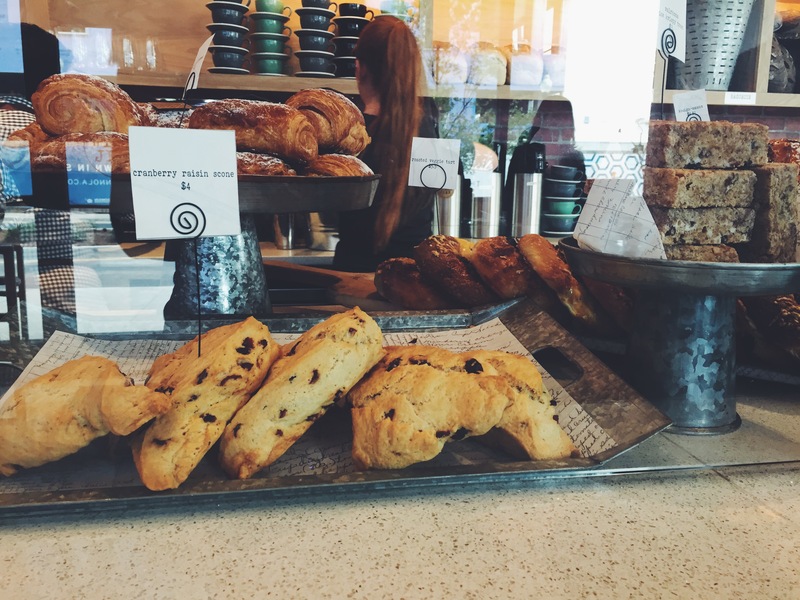 Willa Jean also has a lovely bakery section with beautiful breads and pastries, should you need breakfast on the go. CellarDoor: For dinner we ate at CellarDoor which was good, but not great. (maybe it was just hard to top that brunch?) The entrance is a kind of tucked away side door with lots of dim, romantic, atmospheric lighting inside the restaurant. There is a really cool bio about this history of the building on their site, should you be interested. The staff was helpful and friendly and the place was comfortable, but I wasn’t impressed by the food. We got drinks and their fried chicken wing appetizer (which was actually delicious and a generous portion for an appetizer) but I got the special, which was scallops, and it was literally just 5 scallops arranged on a plate with a swirl of sauce. I needed a vegetable or a grain or something other than 5 seared scallops. Aaron had a similar experience when he ordered the jerk shrimp, but at least he got rice. The food tasted fine, but it was a lot of money to pay for such a tiny portion, especially one advertised as a main course. Oh well. It was a good place to get a drink, but not for an actual meal. Sorry, I didn’t get a picture of this one. dessert at domenica, my first love. The Domenica: We walked to the Domenica next for dessert. We’ve been here a lot, which breaks the new restaurant rule, but we needed something we could count on after our dinner disappointment. This is another John Besh restaurant, and it’s one of my favorite places ever. They use lots of local produce, and the menu is constantly changing with the seasons. I’ve never not been happy with my food there. This place is very versatile: We were there, on date night, but we also saw 3 bachelorettes and two families with small children eating there, everyone in a variety of dress. Also, one time we saw Christ Pratt. It’s located in the Roosevelt hotel, if you ever have a chance to stay there you absolutely should, especially around Christmas when the lobby is beautiful. There is also a sister restaurant, Pizza Domenica, which serves their delicious pizza and where I got a most incredible shredded brussel sprout salad with raisins and almonds and a mustard vinaigrette-obviously I’m not over it yet. It’s located on Magazine street, my favorite section of New Orleans, and is the most kid-friendly of the two. Anyway. On this night I got the Tiramisu (see above), and Aaron got this caramel pudding served in a jar, both were delightful. We try to eat here at least once every time we make a New Orleans trip. District Pies: Our last stop was for breakfast Saturday, at District Pies. We usually stop at their other shop, District Doughnuts, which is delicious and totally over the top. If you haven’t been, maybe you should stop what you’re doing and go right now. They also have really good coffee, and really good sliders. Anyway. District Pies. Their specialty is hand pies, but they also have muffins and cinnamon rolls the size of your head. 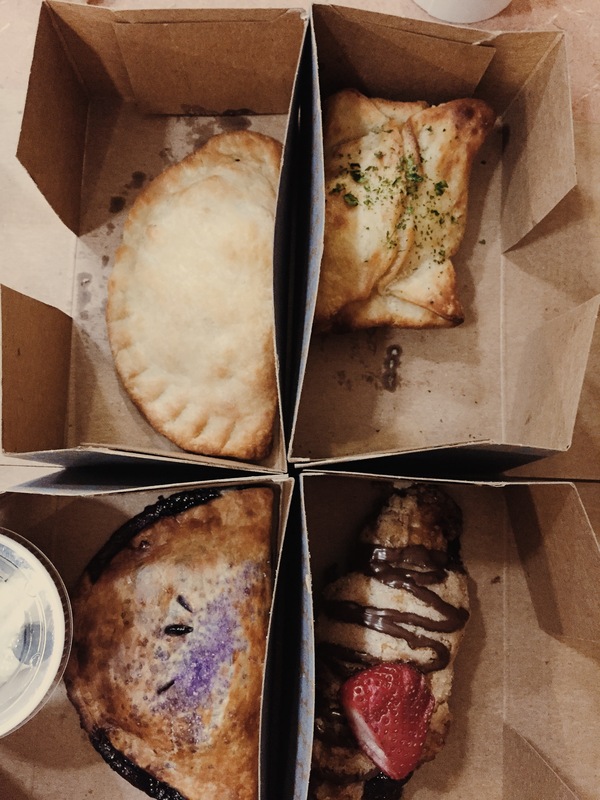 We got the blueberry, the breakfast biscuit pie (with bacon and scrambled eggs inside), the turnover, with biscuit crust and a poached egg in the middle, and some kind of fried croissant pie with nutella in the middle. (see above for visuals). They were good, but I was very satisfied that I have made hand pies at my house that were just as good, if not better. They have a super friendly staff and play great music, but a word of caution: they have no indoor seating, and when we were there it was monsooning outside, so we ran across the street and squatted at Whole Foods. Overall quality/deliciousness of the food: 4, maybe a 4.5. The Manship: To conclude our long eating weekend, we had dinner Monday night at the Manship in Jackson, the last hurrah before we start a diet of romaine lettuce and water. Even though we ate really, really well in New Orleans, everything we had at the Manship was absolutely excellent. I would say it was the best meal we had all weekend. Probably one of the reason I like this place so much is that the executive chef studied under John Besh. We’ve eaten there before, and it was good, but never great. They have really upped their game in the past few months, and it was the best meal I’ve had in ages. The staff was friendly and our waiter was super helpful, but not pushy and gave us plenty of space. He also recommended the perfect wine, which I didn’t even know I wanted until after I tasted it. My favorite thing about this is that my favorite meal was in my home city, which isn’t something I’ve been able to say until the past few months. Jackson has really upped its food game. I’m so thankful for creative chefs and urban pioneers who want to make this city, and state, which ranks last in a lot of areas, better by bringing in good culture and good food. Kudos, you guys! We practically waddled out of there. It was a great birthday weekend, full of great food spent with my favorite human. I’m really, really thankful for the gift of good food and a great marriage. I rate everything a 5!